Individuals who pursue careers in the healthcare industry pay top dollar for the most advanced degrees and education, so why do most healthcare professionals settle for below average lab coats? Medelita produces the highest quality products for healthcare professionals who take their careers seriously. Each product the company creates is technically designed down to the very last thread. For example, the M3 E. Wilson Slim Fit Lab Coat is just one of the many products designed with the company’s state-of-the-art M3 fabric — a wrinkle resistant fabric built with proprietary technology that prevents bacteria from getting trapped in the garment. 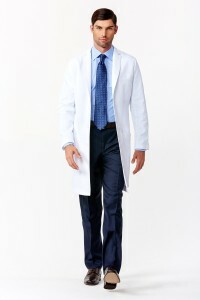 It repels fluid, soil, and stains, fits like blazer and while it is light and breathable, garments made from this fabric are the most durable the most durable lab coats on the market. The M3 Callia Lab Coat is a recently refined signature women’s coat designed for healthcare professionals who want portray an air of subtle femininity while maintaining a confident look in the workplace. All of Medelita’s products dry 4 times faster than cotton and offer the necessary ergonomics for comfort and ideal range of motion. The creators of Medelita lab coats and scrubs are healthcare professionals who create products for healthcare professionals. This entry was posted in Lab Coats and tagged Lab Coat Style, lab coats, Performance Fabric on March 4, 2016 by Riley Schatzle.